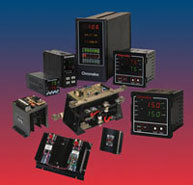 Temperature Controls from Chromalox are the solution for process control. Single loop controllers are designed for panel mounting in 1/4, 1/8 and 1/16 DIN sizes. Multi-loop and non-indicating controls are also available. Advanced models include: PID operating modes for heating and/or cooling, fuzzy logic control, dual output/dual alarm protection, NEMA 4X front panel, ramp/soak programming and digital communications. Standard Power Control Panels come as an off-the-shelf panel available in NEMA 12, 7, 4X or 4 enclosures with integrated temperature controls and overtemperature controls. Preconfigured to meet your requirements with SCR power controls or contactors, transformers, firing cards, fuses, pushbuttons, switches, indicators and special labeling. Backed by proven UL, CSA and cUL agency approvals. Monitors & Overtemperature Controllers provide safety protection for your critical equipment, products an processes. Selected models are available with alarm relay outputs, digital LED displays, thermocouple and RTD inputs for ease of interfacing, NEMA 4X front panels and digital communications. UL, cUL and FM approved models are also available. Custom Power Control Panels offered by Chromalox are engineered with solid state controls built to the most rigid standards and sized for virtually any application or specification. Select from many NEMA type enclosures, single or three-phase load requirements, voltages, transformers, fusing, contactors, firing cards and more We can design the power control panel best suited for your specific application. SCR Power Control Components are easily integrated and deliver high precision power modulation and smooth power output to electric resistance heating applications. Components include zero-crossover or phase-angle-fired configurations, 120 to 575 Vac, 0 to 1600 Amps, drive single and three-phase loads. Features include current limiting, over-current trip and LED status indicators. Chromalox Precision Heat and Control, 701 Alpha Drive, Pittsburgh, PA 15238. Tel: 800-4432640; Fax: 412-967-5148.